The Walther PPQ M2 in 45 ACP gives you 12 rounds of stopping power, and with adjustable sights and a 4.25 inch barrel, this 45 is both accurate and concealable. Online reviews, do not own a .45 ACP Pistol...decided it was time to get one & based on reviews this seemed best .45 ACP Pistol for the price. I have the PPQ M2 9 mm and it is one of my favorites. I read the other customers comments about the .45 and that made this an easy choice to add to my collection. I own 4 other Walther pistols, 2 PPQ and 2 PPS. All are great shooters! Best trigger feel, best trigger reset (short) and great ergonomics! I highly recommend this pistol and all of the pistols in the Walther PPQ line. Incredible gun. Perfect ergonomics. Perfect accuracy. Perfect function. It’s a very nice gun, feels good in my hand, very similar feel to my VP9, both the molded and textured grip, and very accurate and consistent when shooting. AWESOME TRIGGER! GREAT SIGHTS EASY SHOOTER! Smooth firing with tight groups right out of the box. I was impressed how smoothly everything went. I ordered and two days later it was at dealer to be picked up. Very smooth and pleasant. Ergonomics of this design are absolutely outstanding. The gun feels so natural in your hand. My pistol was extremely accurate right out of the box. I love this platform. The PPQ has *the* best stock striker fired trigger of any gun i have tried hands down. I definitely beats out the other striker fired guns I own. It is extremely accurate and handles the .45 recoil very well. I am not sure you can get a nicer, easier shooting gun in this price range. 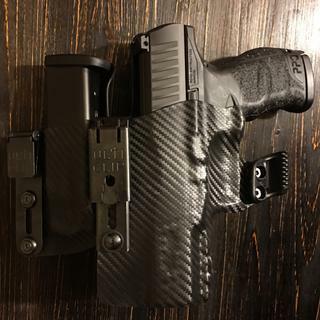 The only con is that it is a slightly bigger gun than most so it can be difficult to conceal for smaller framed carriers. 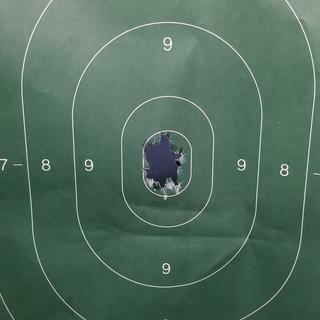 48 shot group at 8 yards. Walther & GAG, A #1 Combination! Once again GAG has out done themselves. Ordered it Saturday afternoon and it was at my FFL Monday a.m. As for the Walther PPQ45, I received it in excellent condition . It has the sweetest trigger break and reset. Feels great in the hand and shoots without a lot of felt recoil and muzzle flip. So far no stoppages or issues of any kind. The only problem I have with it is it keeps running outta ammo. I'd love to remedy that somehow. This gun is pure Walther and although it's very new, I have no doubt that it'll perform as Walther should. If you have debated about purchasing a PPQ45 then here is one guy's opinion, Do it !! And for the best price and service get it right here from GradAGun. Once again, GAG was excellent in providing service. I ordered it, took no time at all to go and pick it up in person. The guys there are great, courteous, and just good guys. I love this gun! This baby was dead on out of the box. The trigger is so smooth. I have the PPQ M2 in 9mm and that was love at first feel. This is the twin of the 9mm, feel, accuracy, quality, and in .45 APC! Everyone should have this gun. The PPQ M2 is a true breakthrough in ergonomics for self-defense handguns. The sculpted grip meshes smoothly into the hand. The trigger is the finest ever on a polymer, striker-fired handgun. The styling is elegant and trim. What’s more, PPQ M2 has a new traditional reversible mag release button. The leading edge just took another step forward.